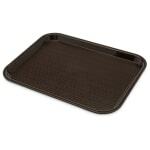 Economical lightweight polypropylene trays feature skid-resistant surface and drying/stacking lugs. Move your mouse over a color image sample to view the color name. Click on an image thumbnail to choose the color option before adding product to shopping cart.